Hitting the CENTER of the club face...IMPORTANT? With the help of Trackman, we are going to examine how much an off center hit effects the curvature on a golf shot. In the top right picture, one of my students hit a shot which if hit in the center of the face should have gone relatively straight. This is because where the golf club was traveling through impact (club path) is close to 0 and where the face is pointing at impact (face angle) is also close to 0. Another way of saying that would be the path of the golf club was traveling down the target line with a face square to the target. As you can see in the screen graphic, this shot did not go straight. Before we proceed, let’s first define 2 terms. Spin Axis is the amount of tilt the golf ball has. The ball spins on one single axis. It does not have backspin and sidespin. A difference between where the club path is moving and where the face is pointed is one way the axis of the golf ball gets tilted. That difference is represented in the graphic above by Face to Path. 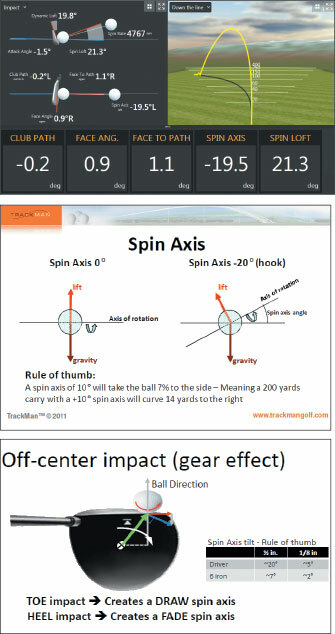 As you can see, that number is relatively low indicating the Spin Axis of the golf ball should be minimally tilted. It is not. It has been tilted 19.5 degrees to the left. Another way the Spin Axis gets tilted is by an off center hit. How far off the toe or heel the ball is struck will either increase or decrease the axis tilt of the ball. With a driver, a ½ inch strike towards either the toe or heel will tilt the axis of the golf ball approximately 20 degrees. In our example, our Spin Axis was -19.5 degrees indicating a DRAW Axis (for a right handed player.) With that information, we know with relative certainty the ball was struck approximately ½ inch on the toe. Scott Sackett, GOLF Magazine Top 100 Teacher the past 14 years, just voted as one of Golf Digest’s Best Teacher in the State for the fifth year in a row. Also Director of Instruction at Park Meadows CC in Park City, Utah and while in Scottsdale he teaches at McCormick Ranch Golf Club. Scott just opened his second Academy at SunRidge Canyon Golf Club. He is offering a NEW CLIENT SPECIAL. Email Scott for details at scott@scottsackett.com; WEBSITE: wwwscottsackett.com.